The Dystenium Science Daily provides news and information about important developments in science as taken from the Twitter feeds of major scientific organizations and news outlets being followed by DYSTENIUM SCIENCE – Science Is An Original Idea™. 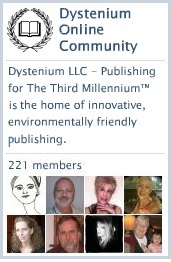 DYSTENIUM SCIENCE is the scientific imprint of DYSTENIUM LLC – Publishing for The Third Millennium™. The imprint is focused primarily on publishing original research within life and biomedical science. Initial areas of new publication development interest are neuroscience, genetics and forensic science. Look for more news and announcements about DYSTENIUM SCIENCE soon. For more information about DYSTENIUM imprints and publishing activities, contact Don Odom by telephone at (917) 725-1484 or by email at don.odom@dystenium.com. This entry was posted in DYSTENIUM, DYSTENIUM Science, ning, The DYSTENIUM SCIENCE DAILY, Uncategorized and tagged Dystenium, SCIENCE, The DYSTENIUM SCIENCE DAILY. Bookmark the permalink.